The artist was a master of old painting, and he imitated a similar technique in his own paintings. Somov was a true professional, having a very delicate artistic taste and well versed in the history of culture. The main focus of the master was the image of the nobility of the eighteenth century, distinguished by easy nonchalance, cheerfulness, living a carefree and happy life. On his canvases one can observe love scenes between ladies and gentlemen, distinguished by grace and coquetry. His characters are graceful and playful young people, having fun in the gardens and on the green lawns. They have fun and play, imitating love feelings and flirting. The artist beautifully depicts the stunning toilets of his characters, admiring their grace and pomp. But at the same time, the characters themselves experience certain mental anguish, being devastated and disappointed. Their existence is illusory, and they seem to be frozen in one moment, which will never have a continuation. 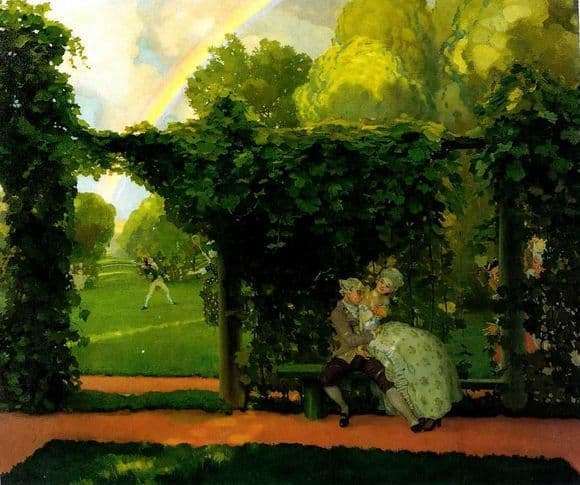 Somov’s works are fraught with romantic irony and seem slightly refined. The unrealism of the events taking place is underlined by the drawstring image of space, the same is read in the action of the heroes. The main characters of this picture are a couple of noble origin, who are more like dolls than people. They are distinguished by a certain mannerism, scheming and no matter what, they seem funny. The artist paid great attention to drawing the landscape, which is an etude depicting a living, beautiful nature. The artist chose to depict colors and forms more decoratively, paying attention to the softness of the lines and the harmony of the entire landscape as a whole. Cloth inherent refined elegance and a sense of fleeting vision, seeming to have flashed and disappeared.